With the exception of much challenge, few adventures compare to this one. It's likely you'll go home with a smile on your face. I must have been lucky. There wasn't another soul in the canyon. The weather was perfect and so was the water. There is no official trailhead. Just a ramada, a flipped over restroom and a sign telling you everything you can't do marks the start of this trail. I used "Canyoneering Arizona" to find this trail. The book says it's seven miles down the river road to Cibecue Creek. This is incorrect, it's only four. As there isn't any signage it was a little confusing. So just remember. When a creek crosses the road coming out of a side canyon after four miles that's the right area. Also, more importantly the book mentions "swimming hole". Swimming is prohibited in all Reservation waters, according to the sign and special use permit. Follow the creek upstream for 1.5 miles to the pounding waterfall. In the beginning you can follow the left bank. It alternates back and forth to many times to count. The creek never got more than knee high to the falls. With one exception. There is a wall to wall pool after mid way. You can find a slip though the boulders on the left. Tons of river debris may make the narrow slot a challenge after big storms. The further you go the better it gets. Clear blue green pools get wider and the canyon narrows. A couple tiny cascades and a few large boulders add to the experience. Be careful in the creek. Stepping out of the creek proved to be more slippery than in the creek. I saw only one fish the entire trip. It was about four to five inches long and zipped right by me. It seemed like more than a mile of travel to the waterfall. Then again the going is slow in and out of the creek. Every corner I kept thinking it must be coming soon. Then I realized it didn't really matter as the scenery was awesome. The last turn to the falls is almost worth the trip alone. The canyon bends back and forth. Clear water pools look perfect. The canyon cuts into the walls and it gets narrow. You can hear the pounding of the falls ahead. Okay, so swimming is not allowed as mentioned above. So I won't go into that. Oh yeah, exploring beyond the falls is not allowed without a guide. It doesn't really matter though, there's plenty to consume in the mile you're allowed to explore. Anyhow have fun and be safe. • Some areas are closed to access from Labor Day to April 1st, read about it in the link provided below. From Globe head north for about 40 miles on US60. Continue to where US60 goes down into the Salt River Canyon. Just after it crosses the river there is a dirt road on the left(west), take it. In a very short distance the road forks. Take the right over the cattle guards. 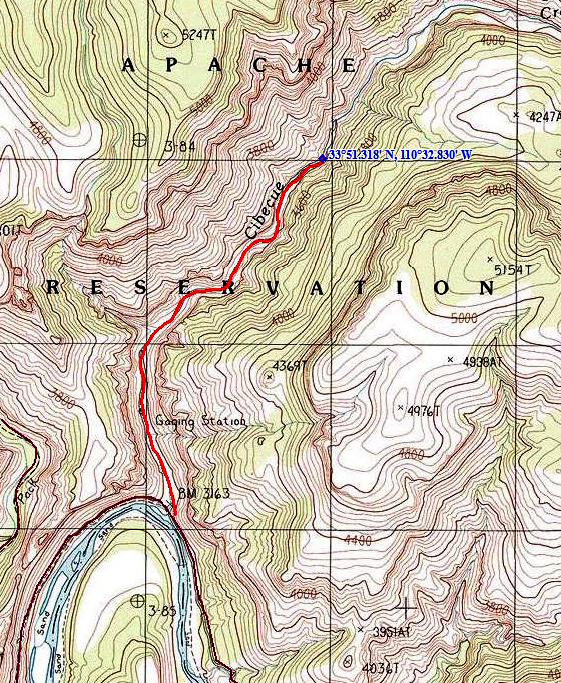 Continue on this for about 4 miles to Cibecue Canyon. Be very careful in the first couple miles down. The edge of the road is a sheer cliff and is washed out in spots. Not to mention small boulders fall from above. It seemed rather dangerous, but what do I know. You know your there when a side canyon appears on your right. This is Cibecue and it flows right over the road. There's no need to cross the river but there is more room on the other side if it's real busy.